Mirrors have long been a great tool for home décor as they illuminate and add depth to rooms. They also create a special effect through its reflection which also makes rooms seem more colorful. 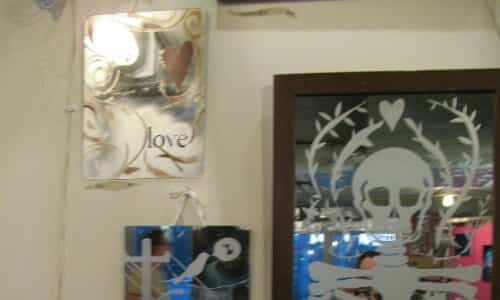 The standard mirror works well, but the recent trend of the etched mirror has slowly gained some ground. Featuring a unique design of their own, you are able to combine both creativity of a piece of art with the special elements of the mirror. 1. Create your decal with cardboard or vinyl if you want more detail. 2. Clean your mirror thoroughly and securely attach decal to mirror. 3. Using the foam brush, apply etching cream to empty surface created by decal. Be sure to apply thickly and evenly. 4. Allow the cream to set for 10 to 15 minutes and remove decal. 5. Clean mirror thoroughly with glass cleaner or water (image will not come off after it is set). This process works well for any mirror and is especially great for any wall mirror arch. Use your imagination and stylize your mirrors with this fun DIY project.